Iran dismisses claims by Israeli officials that Iranian targets in Syria were attacked. 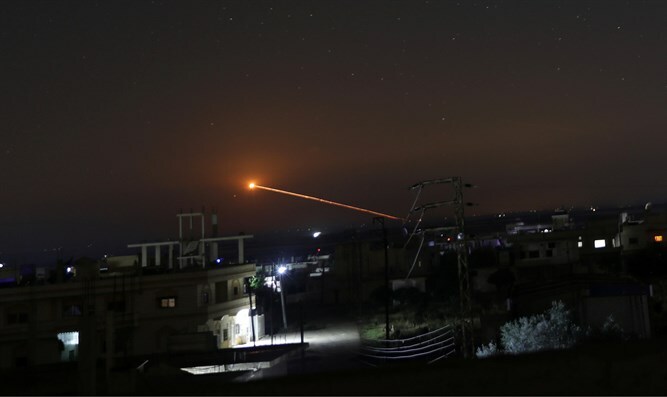 Iran on Monday dismissed claims by Israeli officials that Israel attacked thousands of Iranian targets in Syria, denying the Islamic Republic even has a presence in Syria. “The Zionist War Ministry's comments are baseless, false, misleading, and an attempt to justify the failures of the regime in the region,” said Bahrem Qasemi, a spokesman for the Iranian Foreign Ministry, according to the IRNA news agency. “Iran does not have a military base and military presence in Syria and was present at the request of the Syrian government for advisory mission and fighting the terrorists,” claimed Qasemi. He argued that the victories of the Syrian army have caused the Zionists to be angry, resulting in their claims. On Saturday, outgoing IDF Chief of Staff Gadi Eizenkot admitted in an interview with the New York Times that the IDF carried out many attacks in Syria and Lebanon during his term. “We operated under a certain threshold until two-and-a-half years ago. And then we noticed a significant change in Iran’s strategy. Their vision was to have significant influence in Syria by building a force of up to 100,000 Shiite fighters from Pakistan, Afghanistan and Iraq," he said. On Sunday, Prime Minister Binyamin Netanyahu broke with his country’s long-standing policy of not publicly accepting responsibility for airstrikes in Syria, and acknowledged that Israel’s air force had attacked Iranian weapons depots at the Damascus International Airport over the past few days. Despite Qasemi’s claims otherwise, Iran is a key supporter of the Assad regime in Syria, having providing the regime with both financial aid and military advisers against a range of opposing forces since the start of the Syrian civil war in 2011. Ali Akbar Velayati, a top aide to Iranian Supreme Leader Ayatollah Ali Khamenei, made clearlast summer that Iran would withdraw its “military advisers” from Syria and Iraq only if their governments wanted it to. More recently, Iran's defense minister visited Damascus and said his country will continue its support of the Syrian government, while stressing the nature of the two countries' cooperation won't be decided by a "third party."